Crown moulding is more popular than ever, and has endless uses, from providing detail to a handmade piece of furniture to creating visual breathing space between a wall and a ceiling. Crown moulding has also made its way to the exterior of a house, providing architectural detail to give the home character. The types of crown moulding are numerous, and there are numerous options for where to use it. Moulding can be as ornate as a pilaster or as simple as a quarter-round of wood trim. The use of crown moulding in a home has been a part of the building tradition since the time of the Greeks and Romans. In addition to providing classic architectural details, it can set the tone of a room, from ornate to modern. Crown moulding embellishments are a standard in homes priced in the upper brackets, but moulding use is steadily increasing in lower-priced homes as well because of its great visual appeal. The ancient Greeks used moulding in buildings to visually divide spaces into smaller units. Their mouldings were based on the classical shape of the ellipse, parabola and hyperbola. The Romans simplified these shapes, basing their mouldings on circles, developing the half-round and quarter-round shapes. Both the Greek and Roman versions of moulding are still in use today and are considereed the building blocks of interior ornamentation. Prior to 1850, all moulding was made on-site by carpenters using hand planes, chisels and gouges. Early examples of dentil moulding, for example, show each little piece of dentil individually carved, sanded and nailed in place. This tedious process of creating visual excitement got a boost in the 1850's, when large planing machines were developed to produce moulding for a mass market. 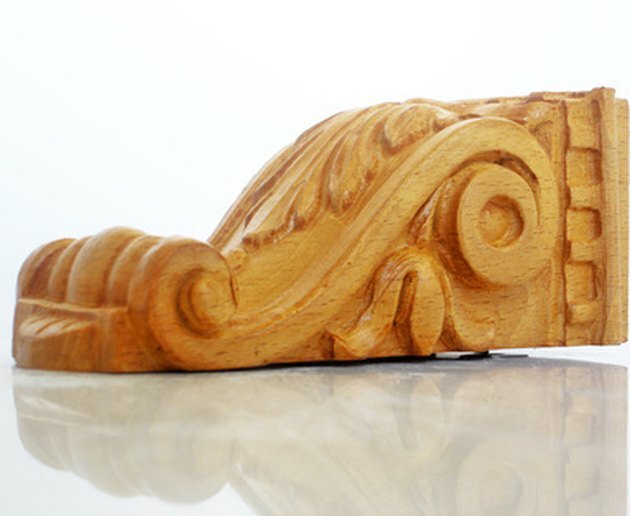 More elaborate and sophisticated styles of moulding were invented and the price became more affordable. Today there are over 140 different styles of moulding available at hardware stores, in materials from wood to polyurethane. Crown moulding today is a generic term for all types of moulding. However, there are different types of moulding with different uses. Crown is the most popular type of cornice moulding—a single-piece moulding that is installed on an angle adjoining a ceiling and wall. The profile of the moulding projects onto both the ceiling and the wall, providing a beautiful transition between them. There are many different classic styles of crown, such as cartouche, dentil, egg and dart and gulloche. Crown can also lend decorative support for horizontal architectural elements, such as built-in bookshelves and niches, and can be used in combination with other mouldings to add detail. A frieze moulding is a horizontal wall moulding that is a wide band, often adorned with an ornamental motif. It usually runs under cornice moulding, one-third to one-half way down the wall. Often, the space from the frieze up to the cornice moulding is painted a different color from the rest of the wall. This type of moulding is common in rooms with high ceilings, as it visually brings the ceiling closer. Moulding can enhance any room, because it reflects the light, adds dimension, creates visual interest and increases a home's aesthetic appeal. With so many styles and shapes of moulding available today, it's easy to create a one-of-a-kind look for your home. You can use moulding inside the room, on the outside of the home or on furniture to add weight and substance. What Is the Difference Between Cove & Crown Molding?